At the 2006 Reunion in Branson, Missouri, the members present unanimously voted to accept the 191st AHC Association and it's bylaws. Copies of the bylaws are available via email or mail by contacting Bill Janes - bj@191ahc.org, or at 191st AHC Association membership meetings. Subsequently, the 191st AHC Association was incorporated in the State of Texas effective 9 Dec 2005. Additionally, an application for Recognition of Exemption under Section 501 (c) (3) has been approved by the Internal Revenue Service to secure the Association's tax-exempt status as of 5 April 2006. The 191st AHC Association is qualified to receive tax deductible bequests, devises, transfers or gifts under section 2055, 2106, or 2522 of the code. Contributions are deductible under section 170 of the code. To maintain the friendships among those who served in the 191st AHC by providing a website for ease of finding one another; to establish communications; and to provide a point to gather our history. To remember those who gave their lives while serving in the 191st AHC; to promote the healing with the families who suffered those losses by providing a dignified memorial service at our reunions honoring each who gave his life. To encourage and embrace their families to seek healing in person with us; and to assist those families in documenting their loved ones service. To care for our current members as we lose them and their loved ones by providing a vehicle, our website and personal communications, to notify members of these occurrences, notifying members of those families who are requesting information, and provide for emotional support for all of us. To manage reunion finances so that future reunions accomplish the above purposes by insuring that the cost of attendance is kept as low as possible for a dignified reunion so all that wish to attend can do so, to avoid the volunteer leader having to assume personal responsibility for the conduct of the reunion, and provide an opportunity for attendees to purchase memorabilia. To record the history of the 191st AHC by providing a focal point for the accumulation of data, encouraging people to bring it forward for proper recording and storage, and to stimulate the camaraderie of the Association. Regular (voting) membership is available to all former unit members. Membership begins January 1st of each year and ends on December 31st. Dues will be paid annually. Membership for the first year, 2006, will be prorated from September 1, 2006 to the end of the year. Life (voting) memberships are available to those who choose this option, and pay appropriate dues. Lifetime memberships will not be prorated. The Board of Directors may appoint unit members that cannot pay dues to Regular membership at its discretion. Nonvoting Associate Memberships are available to family members of those who are members of the 191st AHC as regular or life members, and also to family members of those who gave their lives serving in the 191st. Associate membership dues are minimal. Honorary Memberships can be bestowed upon a person by the Board of Directors at their discretion. We of the 191st want to recognize the contributions of two key individuals in our effort to incorporate our association. 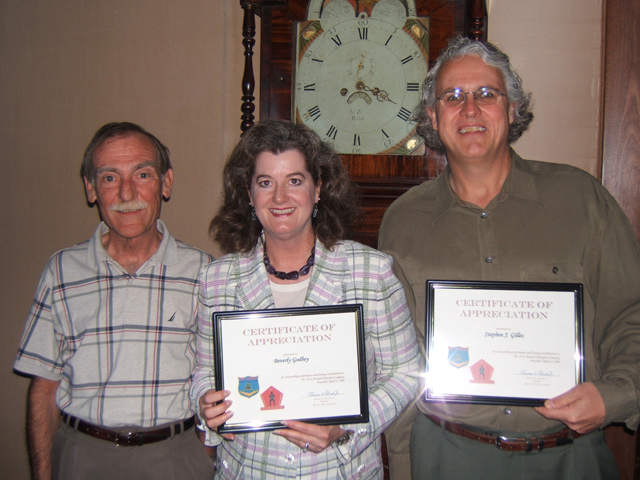 Beverly Godbey, and Stephen Gilles have gone well beyond the call of duty on behalf of the 191st AHC Association. These individuals have taken time from their duties at Gardere Wynne Sewell LLP, a prestigious law firm in Dallas, to help us pull this association together by the bootstraps. As a token of our gratitude, certificates of appreciation were presented to Beverly and Stephen at a lunch buffet at the Tower Club in downtown Dallas today. Attendees at the luncheon were Beverly and Stephen, Dan Lain and Ed McKee of Lain, Faulkner & Co., P.C., and myself. Ed, of course, is a former Bounty Hunter. Dan Lain, a Vietnam Vet himself, stepped up and covered the tab. We appreciate Dan's service to this country, and this generous gesture. The picture below, left to right is me, Beverly Godbey, and Stephen Gilles.